30 years after the first cases of HIV – the red ribbon is the universal symbol of awareness and support for those living with HIV. The red ribbon was the first ever ribbon symbol, inspiring later versions such as the pink ribbon for breast cancer awareness. In 1991 – a decade after the emergence of HIV – a group of 12 artists gathered to discuss a new project for Visual Aids; a New York arts organisation that raises awareness of HIV. They were photographers, painters, film makers and costume designers, and they sat around in the shared gallery space in New York's East Village. 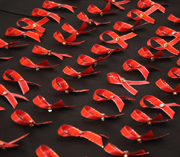 After a short brainstorm they had come up with a simple idea that later became one of the most recognised symbols of the decade - the red ribbon, worn to signify awareness and support for people living with HIV. Why did we need a symbol? When the artists sat down to work on this project, their aim was to get people talking about HIV. This was during a time where HIV was highly stigmatised and people living with HIV were suffering behind closed doors, some too scared to even tell their loved ones they were living with the virus. The artists wanted to create a visual expression of compassion for people living with, and affected by, HIV. The artists were inspired by the yellow ribbons tied on trees to denote support for the US military fighting in the Gulf War. Pink and the rainbow colours were rejected because they were too closely associated with the gay community, and they wanted to convey that HIV went beyond the gay community and was relevant to everyone. Red was chosen as it is bold and visible – symbolising passion, a heart and love. The shape was chosen simply because it was easy to make and replicate – anyone can make one by just cutting out a piece of ribbon, looping it around your finger and pinning it on. How did the red ribbon become so well known? In the early days, the artists made the ribbons themselves and distributing them around the New York art scene and dropped them off at theatres. Initially there was a text that went with it, to explain why they were being worn, but eventually this was dropped as its symbolism no longer needed an explanation. Within weeks of the red ribbon idea being born, world-famous actors starting wearing the red ribbon to high-profile award ceremonies such as the Oscars and talking about why it was important. The media also cottoned on, and within a short space of time the red ribbon symbol became universally recognised. At the Freddie Mercury Tribute Concert held at London's Wembley Stadium on Easter Sunday 1992, more than 100,000 red ribbons were distributed among the audience, with performers such as George Michael wearing one. The Red Ribbon continues to be a powerful force in the efforts to increase public awareness of HIV.